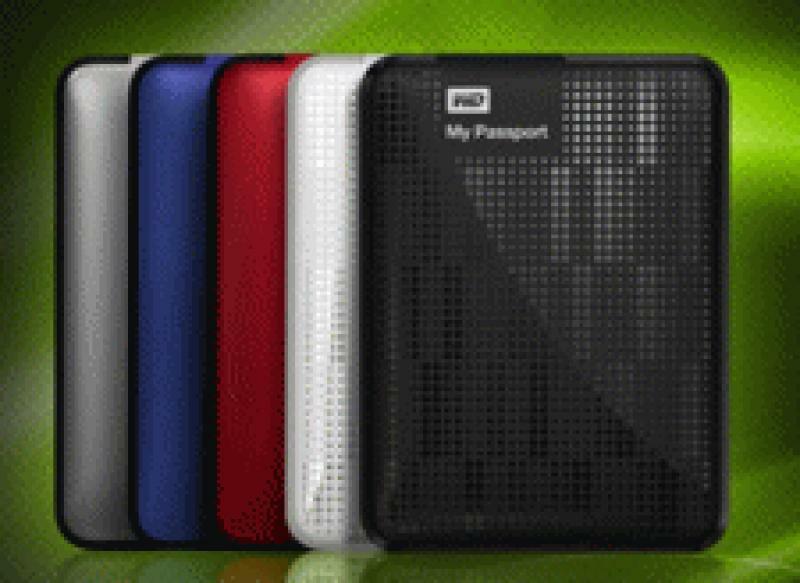 Western Digital just announced the next generation of its top-selling My Passport line of portable hard drives, offering consumers a fresh new enclosure design and the first-ever 2 TB capacity in a portable drive. Now available in five colors: white, black, silver, blue, and red, with a range of capacities beginning from 500 GB. Additionally, the new My Passport drives offer WD SmartWare automatic backup software and WD Security for password protection and hardware encryption. • Learn more in our Media Server Review section. • See a review of the Western Digital My Book Live 1TB networked hard drive. The new My Passport external drives feature ultra-fast USB 3.0 connectivity, USB 2.0 compatibility, automatic backup software, and password protection with hardware encryption. The included software offers the flexibility to customize the drive to a user's storage preferences: installing all features, just the components needed, or using the drive without the software. The new 2 TB model offers massive capacity in a pocket-sized enclosure, affording plenty of secure storage for all of one's photos, video, music, and other important files. My Passport drives come with a 2-year limited warranty and are available online at the WD store at www.wdstore.com and at select retailers and distributors. MSRP is $129.99 USD for 500 GB, $149.99 USD for 750 GB, $179.99 USD for 1 TB, $199.99 for 1.5 TB and $249.99 USD for the new 2 TB edition.